If you are experiencing pain in your back or spine it could be resolved in as little as an hour. By having a medial branch block in Jacksonville you can make the pain stop. This is a way to provide long term pain relief to the affected area while other treatment options are considered. What are Medial Branch Nerves? The spine is comprised of a combination of nerves and bone that all come together to offer the body the ability to bend, stretch and be mobile. The nerves are tiny and grow from the facet joints by the spine and then relay pain from those joints to your brain. When an injury occurs that effects these nerves it can cause them to constantly fire and send an endless signal of pain to your brain. This of course results in your mobility being incredibly limited and other functions of your body being shutdown as your brain tries to deal with the constant signals it is receiving. A medial branch block is an injection which is a combination of anesthetic and steroids. 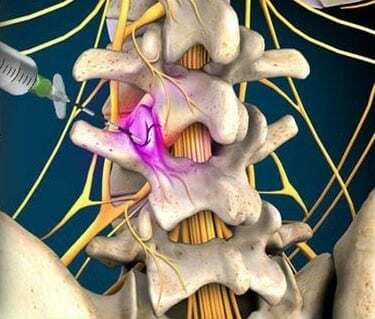 It is injected into the nerve that is closest to the affected facet joint. This then dulls or stops the pain completely and strengthens it against further injury. Depending on the cause of the pain it can offer a long term solution in giving you back your mobility without having to live with the pain. In the worst case scenario it allows you to not have to deal with the pain while a more permanent solution can be found to address the injury that has occurred. The entire procedure generally only takes about an hour from the preparation for the injection to a half an hour of observation afterwards. You shouldn’t have to live with the pain while your Doctor tries to figure out the best way to solve your back pain problem. With an injection you can be pain free while a more permanent fix is found. You can go about living your daily life, working, taking care of your family without having to do it in agony. Speak to the qualified medical professionals are Riverside Pain Physicians today and see if a medial branch block might be the perfect answer to your pain problems. Click here to learn more about Medial Branch Block in Jacksonville.